Good quotes are the kind that inspire us to do better. The safety industry is a tough gig. So we thought you might need some extra inspiration to turn to on a bad day. Quotes pick us up when we’re feeling unmotivated and can be a great tool to help keep your employees focussed on safety. Display them around your workplace, or add them to internal newsletters. Make an impact and get your point across. Without further ado, here are those nuggets of wisdom we’ve sought out. 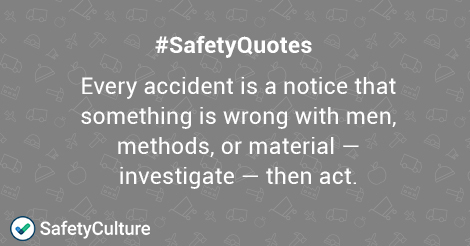 Relevant quotes are a great way to communicate key safety concepts. Illustrate your quotes and bring them to life. Your workplace might be better off for it.